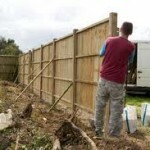 There are several different kinds of fencing so you need to know what type you are planning to use, in this article we will deal with 5’x6’ (1.4x1.8 metre) panels, 1’x6’ concrete gravel boards and 4”x4”x8’ slotted concrete posts. This is to erect fencing on level ground without slopes Decide where it is going or if it is going to replace an existing fence. The first thing you need to do is clear the fence line so there is no obstructions. Decide where your first post is going and dig a hole 6”x6” (150x 150 mm) and 24” (600mm) deep. Put about 2” (50mm) of concrete mix in the bottom of the hole so the supporting lugs are just above ground level. Put the concrete post in the hole with the slots facing the fence line and use a level to make sure it is upright in both directions. Fill the hole with concrete mix and compact down leaving it 3” (75mm) under ground level so you can cover concrete over with soil leaving a neat and clean finish. Decide where the last post is going and repeat the process as described above. Now get a brick layers line or something similar and tie it on top of the first post and stretch it across to the last post and tie off, whilst doing this make sure you keep the line taut, pulling it tight so the line does not bow, if it does just knock in a supporting prop. Now measure along the line to make sure you have the correct distance between the line and ground level. Okay, now to make spacing posts easy and evenly get a piece of batten and cut it the same length as the width of the fence, this will be your post template. Place the batten in the slot of the post you have already erected and on the other end mark the ground giving you the middle of the new hole. Remove the batten and dig the post hole down to the required depth and place concrete mix in the bottom. Put the post in the hole and make sure it is the right height by using the string line to check the top of the post. Use the line to make sure the post is in line by using a spirit level to check. Once the post is in line, lean the post back towards the last post along the fence line. Now lift the gravel board in place with the board resting on the support lug on the first post. Upright the second post while making sure you locate the gravel board onto the supporting lug. Slide the fence panel into the slots making sure that the post is up hard against the gravel board and panel. Recheck that the post is still inline using the spirit level and if necessary move it. Once happy put some concrete mix in the hole and compact down as previously explained. You then carry on with this process until you have erected the fence or you have come to the last panel, if it isn’t a full panel. Measure the gap and cut the panel down to suit making sure you reuse the end panel’s battens. You will also need to cut the concrete gravel board. You will need to use a concrete saw to do this. Give yourself a pat on the back for a job well done. 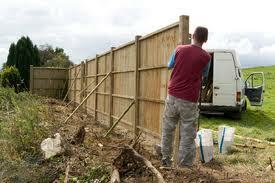 As you can see its not to hard to erect a fence.